Europe maps from Omnimap; world's leading international map store with 275,000 map titles. Europe Road Maps & Atlases. Maps and Atlases by Michelin and Freytag & Berndt. Europe Road Atlas. Atlases by Michelin, Freytag & Berndt, and Kümmerly + Frey. 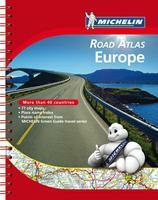 Europe road maps by Freytag & Berndt. Europe Long-Distance Trails Map. Map showing the GR trails across Europe (Grand Randonee long distance hiking trails). Kompass hiking maps for Europe. This publisher has several hundred detailed topographic hiking maps covering all of the popular areas of Europe. We have an extensive stock of European maps. The bulk of the maps are listed under the appropriate country listing. The maps below are continental series and regional maps. For more detailed mapping, please check the appropriate country listing, along with Scandinavia. Europe Road Atlas. 1:500,000 - 1:1,500,000. Michelin. Spiral-bound. The Atlas covers over 40 countries, includes 78 city center maps, and has a full place-name index. The map road map section covers Europe at 1:1,000,000 (102 pages), Scandinavia at 1:1,500,000 (23 pages), Baltic countries at 1:500,000 (31 pages), with Poland, Greece, and Cyprus at 1:700,000 (52 pages). The road map detail includes eleven categories of roads, from unpaved single-lane to divided highways. Car ferries, passenger ferries, toll barriers, steep sections, numerous tourist sites, and much more are shown by symbols. Coverage extends from Moscow to Iceland, to Malta, Cyprus, and western Turkey; eastern Turkey is not covered. Central Europe Road Atlas. 1:500,000 - 1:3,500,000. Freytag & Berndt. This road atlas covers central Europe country by country at 1:500,000, with a legend and map-page overview as an introduction in each country. A place name index follows each country. Cartography is detailed but clear, although two noticeably different styles are used. Driving distances are indicated on the map between specific points and railways and ferry routes are included, also details such as steep gradients, seaonal road closures, filling stations, scenic routes etc. Relief is indicated by some hill shading and spot heights. NOTE: The only countries covered at the 1:500,000 scale are: Austria, Germany, Switzerland, Italy, Slovenia, Croatia, Bosnia & Herzegovina, Hungary, Czech & Slovak Republics, the Benelux countries, Denmark and Poland. All other European countries are covered at 1:3,500,000 and extends to Moscow, western Turkey, Scandinavia and Iceland. At the end is a section of indexed street plans of 34 European city centers. These highlight through-roads, pedestrian zones, railway & metro lines and visitor information points. Europe and Regional Europe Travel Maps by Freytag & Berndt. Freytag & Berndt. Each map has a multilingual legend. Road information is highlighted for easy viewing. 66-22924 Northern Europe, Scandinavia, and Iceland Road Map. 1:2,000,000. Freytag/Berndt. 66-22928 Central Europe Road Map. 1:2,000,000. Freytag/Berndt. 66-22926 Eastern Europe Road Map. 1:2,000,000. Freytag/Berndt. 66-22925 Western Europe Road Map. 1:2,000,000. Freytag/Berndt. 66-2292A Alps Road Map. 1:500,000. Freytag/Berndt. 66-22724 Baltics Region Road Map. 1:400,000. Freytag/Berndt. Europe Road Map. 1:3,000,000. Michelin #705. This is the classic road map of Europe by the famous French tire and map maker. Multilingual legend. Europe Long Distance Footpaths map. 1:3,500,000. Freytag & Berndt. A must for planning hiking trips in Europe. This map of Europe shows all of the long distance footpaths: E1 to E11. This political map also shows the main roads, railroads, and ferries, which helps in planning access to your starting point. The attached text, in German only, contains short descriptions of each route. Multilingual legend. Europe Railway Maps & Atlases - click here for a list. Baltics Road Map. 1:600,000. Reise Know-How. This map combines topographic mapping with road and tourist detail. The road information is clear and elevation is shown using contours, spot heights and altitude shading. The map shows six different types of roads, highlighting scenic routes, places of interest, archaeological sites, monasteries, monuments and viewpoints. Includes coverage of: Estonia, Kaliningrad, Latvia, and Lithuania. Baltic Sea Region Travel Map (Ostsee). 1:1,300,000. Reise Know-How, 2011. Detailed road map of the Baltic Sea region and surrounding coastlines. The reverse side has detailed city-center street maps for Gdansk, Helsinki, Kobenhavn, Riga, St. Petersburg, Stockholm, and Tallinn. With contour lines and spot heights showing elevation, detailed road network, symbols for tourist sites and services. In German with English legend. ISBN 9783831772353. Atlas of True Names - Europe Map. Kalimedia. Size is 16 x 22" (40 x 56 cm). Europe Political Wall Map. 1:5,000,000. Kümmerly + Frey. Attractive political wall map with flags of the nations. Europe Political Map. National Geographic Maps. The classic and best-selling map of Europe. Available in two sizes. Standard size - 23-1/2" x 30-1/4". Enlarged size - 35-1/2" x 45-3/4". Europe Wall Map - Executive Style. National Geographic Maps. Make a statement with the newest addition to our European Wall Map library. The rich tones of the Political Executive map combine the popular antique look with up-to-date information so that you have a map that is elegant enough for the board room, study, or office, and contemporary enough to make it an ideal reference. Available in two sizes; 24 x 30 inches and 36 x 46 inches. Europe Map 1915 with Africa and Asia. National Geographic Society Maps. This beautifully rendered map of Europe was published in July 1915, one year into the First World War. A historical snapshot of a region in turmoil, this map is a must-have for map collectors, as well as those interested in The Great War. A National Geographic classic. Map size is 31 x 28", laminated. European Western Theatre Of War Map 1918. National Geographic Society Maps. Printed in May 1918 a short time before the end of World War I, this map shows the western theatre of war in France and Belgium. Details of battle lines make this map a unique and compelling historical piece perfect for collectors. Map size is 33 x 28", laminated. Central Europe And The Mediterranean Map 1939. National Geographic Society Maps. This map of Central Europe and the Mediterranean shows international boundaries as of September 1, 1939, before Germany invaded Poland. Published in October 1939, this map appeared with the article "War Clouds Over Danzig and Poland&apos;s Port." A unique historical map for collectors. Map size is 37 x 27.5", laminated.